Heckel’s has a comfortable hometown atmosphere with friendly service. Family-style classics like broasted chicken, creamed corn, and big, hearty muffins fill the menu. Breakfast served all day, vegetarian friendly. Free birthday dessert. Heckel's is a favorite spot for some of the Vets I met passing through Klein Hall. I've been in Heckel's a few times and just love their milk shakes. 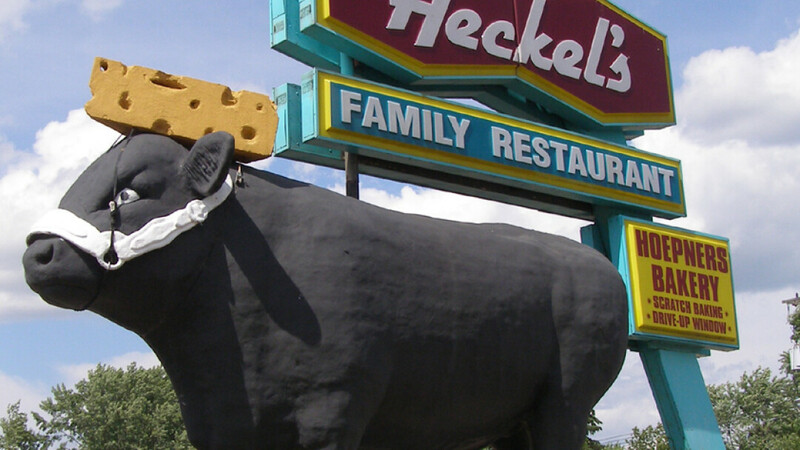 You'll know you're at Heckel's when you spot the cattle out front. Check out the Burger King Car Show just across Hastings Way at Peace Memorial Park. I read the May 11, 2016 reviews, but decided to give it a try based on my own good past experiences. I ended up disappointed. It was 11am, and the place was not busy; only 6 tables in use with 2 waitresses serving. Our waitress was so slow in taking the order, bring us the check, and facilitating our paying the bill. The food took along time to get and was overpriced. Will not be eating there again any time soon. This is our weekend breakfast go to. Food is usually pretty good and priced fine. Staff are not very friendly and good luck if you want a refill on water. I've even asked for a pitcher of it at time, but it comes almost all ice. Ive learned to bring my own bottle of water just in case. Worst restaurant experience I have ever had. Took 45 minutes to get our food and they had probably 10 open tables. The food came out finally and one of our plates had hair on it. Sent it back took 20 minutes to get it back out to us and when the waitress came back out and I said maybe they should stop taking tables and she told me it wasn't her fault that it took forever. Never once said sorry for the hair in the food or the hour long wait. WORST SERVICE I HAVE EVER HAD.